Here’s where you can dig deep into the data to see the latest statistics and trends. Simply choose a market and the type of data you want to see. Other options for breaking down the data will appear on the left. Active listings of homes in Kansas totaled 9,646 at the end of February, representing a 2.9 months' supply, up from a 2.7 months' supply in February 2018. During February, 2,765 contracts for homes were written, 6.4 percent lower than the same month in 2018. 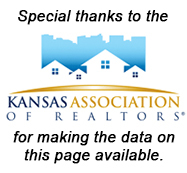 The number of contracts pending for homes in Kansas at the end of February was 4,225. FAQ: How is "Days on Market" calculated? FAQ: What is "Months' Supply"? FAQ: What is the difference between "Average" and "Median" figures? FAQ: What is the difference between "Contracts Written" and "Pending Sales"? FAQ: What is Seasonal Adjustment? FAQ: What is a "Moving Average"?